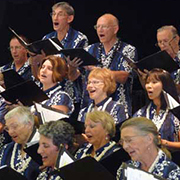 The Kona Choral Society Chorus is that rare blend of accomplished musicians and enthusiastic novices who make choral treasures come to life! Led by our accomplished and inspirational Director, Susan McCreary Duprey, we produce memorable performances of such masterworks as Beethoven’s “Ode to Joy” from his 9th Symphony, Ramírez’s Misa Criolla, Brahms’ Requiem, Handel’s Messiah, the Mozart’s Requiem, Lauridsen’s Lux Aeterna. We also perform music from different genres; including African, Asian, Latin American, Polynesian, American Folk, Black Gospel, Spirituals, as well as traditional Hawaiian choral music. Started in 1990, we are now about 90 strong. We rehearse every Wednesday, September to June, from 6pm to 8pm at the Kealakehe Intermediate School Band Room.